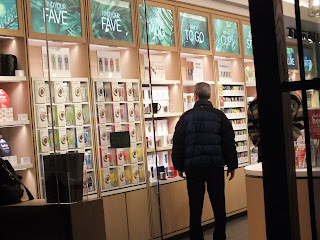 I'd visited DAVIDsTEA (capitals!!!) about two months ago, on a post Alice's Tea Cup walk down Third Avenue. (There's an Alice's just a couple of blocks from here as well, so it looks like we're getting another Tea Strip in Manhattan!) I liked their friendly service - bubbly but not overmuch, and not sullen either. On a decent weather day last week, I decided to get some air, and some tea, so away I went after work. For over a year now, I've been in the habit of drinking coffee in the morning. I'm trying to break this habit, and the best way to do so is to fortify my tea arsenal. I keep a little teapot at work with a built-in infuser, so I was up to the task of making loose tea at my desk. It only takes a minute or two extra in maintenance, and I think it's worth it. At DAVIDs I told Amanda, the nice young lady who helped me (what am I, a grandmother? ), about my coffee issues, and she suggested Coffee Pu'erh, which is Pu'erh with coffee beans and chocolate and almond flavor. I haven't tried it yet, but it seems like an interesting way to bridge the gap. Speaking of chocolate, I picked up a sample of Chocolate Rocket, which isn't 'tea' at all but a maté, which I normally don't go for. If you mix it up with a flavor medley, including, obviously, chocolate, it's a nice hearty drink that's still light enough to be of tea consistency. I like the Long Life Oolong and I can't wait to try Glitter & Gold and The Earl's Garden. I didn't quite buy up the store but got enough small packets to make for a few weeks of novelty. Purists might be wagging their waggables at me right now and thinking I've gone off the deep end with all these flavored teas. On their behalf (and please stop wagging; you'll get whiplash) I assure them that this store has estate black and greens that are only flavored with green tea, so there's choices for everyone. I'm pretty well stocked in both kinds of teas now. The store, on 65th and 3rd (there's also one on Bleecker,) has a little seating in the back, and only a few cookies and things for snacks (a gluten free cookie as well,) so you can spend some time relaxing here. Mainly, though, its strength is as a tea retailer. There's teapots and cups and bath teas and gifts, and everything seemed reasonable in price. And did I mention loose tea, lots of loose tea! Since I doubt they'll open a branch right next to my job, as the east side location is somewhat close, now I'm going to hope for a future shop on Steinway Street. I think we have plenty of tea drinkers in Astoria, and we really don't get enough tea shop love here. In the meantime, the subway directions: 59th Street NQR456, 63rd Street F, 68th Street 6. Possible 2nd Avenue Subway stops in the future. Mmmm...sounds lovely. There is a shocking lack of tea shops in my area--shocking lack of shops in general, actually. 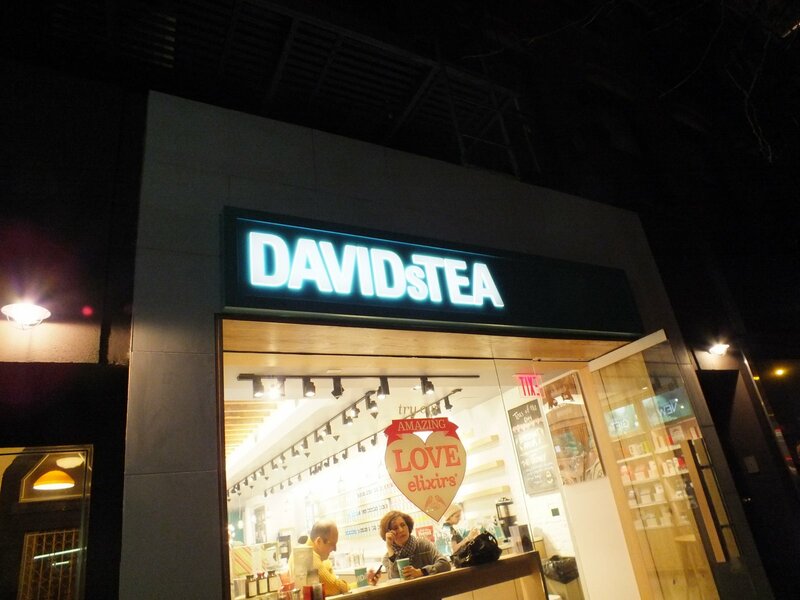 It would be heavenly to go into a place like DAVIDs! Yes, I do realize how tea-spoiled I am. And Brit-spoiled: Tea and Sympathy's just a subway ride away! You'd think I wouldn't need to visit England so much, but there's no logic in 'philia.